Beluga Projects Logistic invited Richard L.Krabbendam to present to a group of Russian Freight Forwarders the Basic Priciples of handling Heavy Lift Safely. Also the Russian representative of the TII Group presented the technical capabilities of the Scheuerle-Kamag-Nicolas portfolio. How a Load should not be rigged and why not like this?? A Question and Answer session conducted by Sergey Ovsienko (Managing Director/Owner) of Beluga Project Logistics. Beluga Projects Logistic is a relatively new company in the Heavy Project handling market in Russia, but since 5 years have shown a steady growth and completed some very challenging projects, amongst others the barging and land transport from the far North of Russia (Siberia) to the middle of the country of a 1300 tons reactor. The first leg of the journey by Beluga’s own newly invested flat top barges (5 Damen Barges of various sizes), then followed by the loading onto Hydraulic Platform Trailers by Beluga’s Enerpac’s SBL1100 Hydraulic gantries (3 sets are owned by Beluga). Finally oncarriage to the jobsite by means of a set of Conventional Scheuerle Platform Trailers and Faymonville SelfPropelled SPT type trailers. Thank you for coming to Moscow and sharing your knowledge with my team and partners. We hope that the first seminar you did was the beginning of a vast learning program that we plan for the Russian heavy cargo specialists. According to our feedback surveys your presentation was very well received and appreciated by all the participants. Our company pays particular attention to the safety of cargo and people that is why we feel important to share the principals presented by you with the all the market leaders. Let’s make our meetings a good tradition and schedule the next seminar this fall in St. Petersburg! In case you want to train and educate yourself and operating crew, buy all updated digital files (836 Mb) containing all SEMINAR SLIDES of the succesful two day seminar “Heavy Transport & Lifting” ! Now as a bonus you will get 47+11 Video fragments (3 GB) added for the same price!! All can be downloaded after successful payment with Credit Card, Giropay or Ideal. START NOW!!! 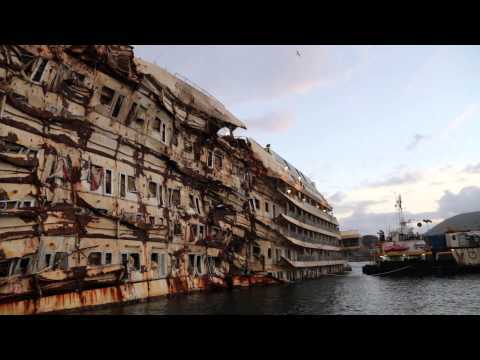 The latest video shot from drones of the Costa Concordia wreckage off Giglio Island in Italy. The video shows how little of the wreckage is above the water now that the ship has been righted. In the video, as the drone flies around the starboard side of the vessel (nearest the land), it shows the damage and discoloration caused when the ship rested on that side underwater for more than a year. New Website launched: Learn all about Heavy Lifts and get the latest News!! Specialist News Comments Off on New Website launched: Learn all about Heavy Lifts and get the latest News!! This new website was launched early March 2014 by The Heavy Lift Specialist: Richard L.Krabbendam, who still runs his existing website: http://www.heavyliftspecialist.com . Take a look and click on the new site above. On Tuesday 12th of March Jumbo signed a Contract with Subsea 7 for the provision of the FPSO Mooring Piles and Ground Chains Installation for the Dana Western Isles Development Project (WIDP). Installation of the mooring piles and chains will be done by Jumbo’s Fairplayer, a Dynamically Positioned Heavy Lift Vessel with 2 x 900 MTon revolving deep-water cranes. The offshore installation works are anticipated to commence in July/August 2014. With the current Ithaca Stella mooring project already in preparation, the Fairplayer will execute Western Isles this summer in a continuous offshore North Sea campaign. Subsequent schedule synergy saves valuable project cost, time and resources. I would like to sincerely thank Subsea 7 for the confidence placed in Jumbo and we are very much looking forward to working together to a successful project completion. The Dana operated Western Isles field is located in Northern North Sea, UK Block 210/24a, situated 90 km to the North East of Shetland. The water depth at site is approximately 160m. The WIDP will be developed using subsea wells tied back to a centrally located FPSO. Oil will be exported by shuttle tanker and gas will be exported through a dedicated pipeline to the existing Tern platform. Dana’s WIPD partner is Cieco. First oil production is expected in Q3, 2015. Subsea 7 is a seabed-to-surface engineering, construction and services contractor to the offshore energy industry worldwide. Dana Petroleum Inc. is an independent North Sea oil and gas company with operations in Europe and Africa. It took months of strategic and safety planning to work out how to get Captain Oprey onto the bulbous bow, which helps to stabilise the ship and streamline movement, and dips in and out of the water depending on currents and swell. But it was an idea too good to pass up. ‘When I suggested we photograph the captain standing on the bulbous bow, they all looked at me like I was a tiny bit mad, but the fact it hadn’t been done was why we had to do it,’ photographer James Morgan told MailOnline. Mr Morgan was in Sydney last week when he got a call that the conditions in Bali were perfect for the shoot and so he hurried to the Indonesian island to capture the images. However, by the time he arrived the conditions had worsened and he spent a ‘nervous five or six hours on the bridge’, before the weather calmed and they were able to get the captain safely onto the bulbous bow. Mr Morgan said ‘safety was paramount’ and they used two safety boats to transport Captain Oprey to the bow. ‘For me, the lines, the shapes, the curves of the Queen Mary 2, make her the most amazing ocean liner in the world, she really is,’ he said.He took the shot from a small boat floating in front of the Queen Mary 2. Mr Morgan, who has been taking photos for Cunard, who own the Queen Mary 2, for ten years, says he wanted to take photographs for the anniversary of the liner that would showcase her beauty. The Queen Mary 2 accommodates 2,620 passengers and 1,253 crew. In her first 10 years of operation, the ocean liner has undertaken more than 420 voyages including 200 transatlantic crossings. She is currently completing a round-the-world journey to celebrate the tenth anniversary, culminating with a large celebration in Southampton in May. In order to capture the size of the liner, the Sydney-based photographer used a very wide angle lens on his Nikon camera. For Captain Oprey it was an experience he will never forget. ‘The captain was very, very, very excited to be part of it. It’s somewhere he’s never been; he’s always 12 storeys above conducting his team from the bridge,’ said Mr Morgan. 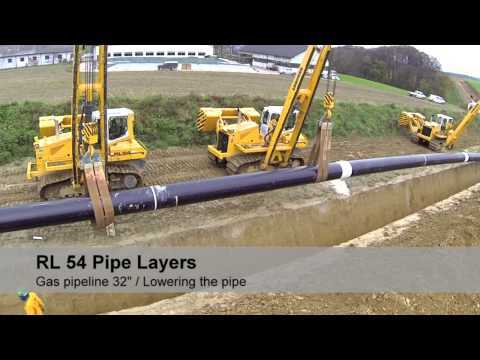 The design of the Liebherr pipelayers is orientated around the application requirements of modern pipeline building sites. A comprehensible control with only two joysticks for all travel and steering movements, as well as actuation of the boom reduce the possibility of faulty operation. The tracks of the hydrostatic travel drive, with continuous power to both tracks, and without switch procedures, allow simple traversal of steep slopes. As the travel drive is wear-free, and also works as an operating brake, a reinforced braking system is not needed, even in mountainous terrain.